Computing “generations” used to be defined by changing computer hardware. Not anymore. 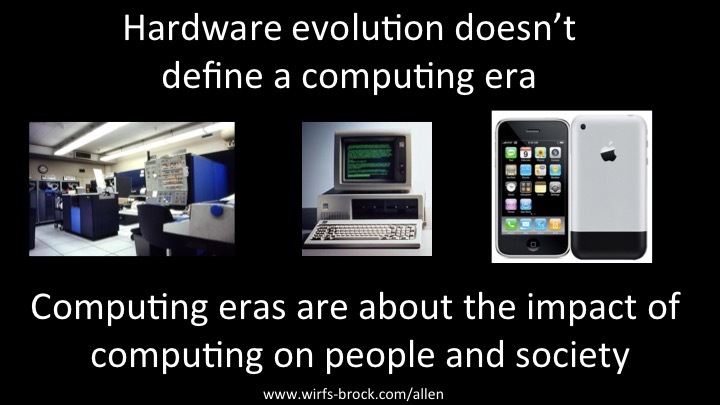 The evolution of computing hardware (and software) technologies may enable the transition to a new era of computing. But it isn’t the hardware that really defines such an era. Instead, a new computing era emerges when hardware and software innovations result in fundamental changes to the way that computing impacts people and society. A new computing era is about completely rethinking what we do with computers.